Am I Yoga Teacher Material? How does anyone know? Well, in my humble opinion, if the idea even broaches your mind, then you’re a candidate. The more yoga teachers the better our world, I always say. But truly, what are the qualifications? For many new yogis, falling in love with yoga is quickly followed by the thought of becoming a yoga teacher. Then followed by many questions, like…am I flexible enough? Can I teach to a group? Where to begin? How much does training cost? Should I quit my day job? Should I move to India, or go to an Ashram? 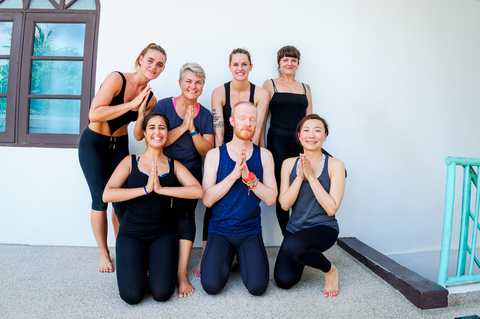 After teaching yoga for more than 22 years, in various platforms from beginner classes to international teacher training…I’m quick to say that if you think you’d like to teach yoga, then even thinking about it might mean that you like to share the goodness and gifts of what you love…yoga! Right on, so go for it! how many years has the lead teacher been teaching? why do they like teaching? what advice can they offer a newbie teacher? who do they learned from? why are they leading the training? Be prepared for good leaders to ask questions of you, such as why you’d like to teach. Teaching yoga requires an open mind for learning about yourself, then sharing that with others. Once you know the fundamentals you can broaden your teaching skills with those fundamentals. Spiritual and physical wealth are different. Understand if you’d like to teach part time after your full time job, or if you’d prefer to teach full time. Sure, teacher training is competitive, and a necessary part of the bottom line for many yoga businesses. More than 20 million Americans practice this ancient fusion of exercise and spirituality, fueling a $27 billion industry. Treat your tuition as an investment, in taking the steps to get a return on that investment. Tell 3 of your fav teachers that you’re thinking of teaching and ask their opinion. Teaching yoga is an honor. Helping your community thrive and learn about their bodies and soul is deeply gratifying. Be confident that finding your niche and to teach will only make our world a better place. View some additional tips on how to find the best yoga teacher training here. Denese Cavanaugh ERYT500 has studied with master teachers since 1995, and has been teaching yoga since 1997. Denese teaches various yoga workshops in the US and abroad as well as weekly and monthly classes in the Washington, DC and NYC area. Her many teaching styles include Ashtanga Vinyasa Primary Series, Iyengar Alignment inspired, Vinyasa Flow, Power Yoga, Restorative, Prenatal and Kids Yoga. Yoga has helped Denese uncover her most joyful, most authentic version of herself; her non-dogmatic approach inspires others to consciously reveal a new found balance, while having a blast on the mat. Large presentational venues from 500 to 3000 participants come easy for Denese, and she loves sharing with her community. She is humbled and grateful to her yoga teachers for sharing their unbounded insight and generosity, and is honored to also share that generous evolution with others. She currently offers restorative Retreats, Mala Flow 200hr RYT curriculum to teachers here and abroad, such as Milan, Italy and has taught in Goa, India. Follow Denese at denesecavanaugh.com.